Extreame Savings Item! Free Shipping Included! 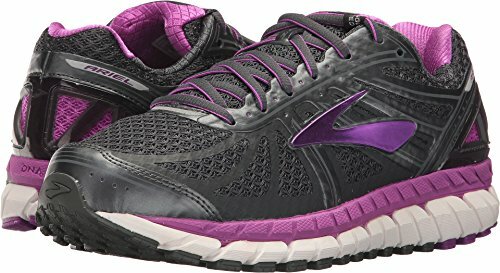 Save 47% on the Brooks Women's Ariel '16 Anthracite/Purple Cactus Flower/Primer Grey 7 B US by Brooks at Zen Slippers. MPN: 120219_1B059. Hurry! Limited time offer. Offer valid only while supplies last. Show 'em what you're really made of by powering through those last grueling miles in the Brooks® Ariel '16 running shoe! Predecessor: Beast 14. Show 'em what you're really made of by powering through those last grueling miles in the Brooks® Ariel '16 running shoe! Predecessor: Beast 14. Support Type: Overpronation/Stability. Cushioning: Maximum cushioning. Surface: Road. Differential: 12 mm. Built for the sever overpronator who requires motion control and high-level cushioning. Moisture-managing Element mesh upper supplies protection from various elements, while maintaining a cool in-shoe environment. External, structured saddle allows for adjustable support. Lace-up closure. External heel counter helps stabilize the foot. Plush tongue and collar. Element mesh lining wicks moisture away, and offers a great in-shoe feel. Removable sockliner. Super DNA midsole delivers maximum cushioning, enhanced energy return, and support. Full-length S-257 Cushsole midsole compound utilizes an insole board for increased plush and flexibility. Tuned density to fit this runner's specific needs. DRB® Accel shank-like unit promotes torsional rigidity in the mid-foot, while allowing the heel and forefoot to act independently. Extended Progressive Diagonal Rollbar (PDRB) presents a robust, dual density post at the medial arch allowing for progressive pronation control. Full-length Segmented Crash Pad encourages a smooth heel-to-toe transition with each step. Durable HPR Green™ outsole is comprised of environment-friendly silica for premium wet-dry traction and skid resistance. Abrasion-resistant HPR Plus rubber outsole provides extended durability right where it's needed. Omega Flex Grooves allow for more natural forefoot movement and fluidity. Linear platform. Imported. Measurements: Weight: 11 oz Product measurements were taken using size 7.5, width B - Medium. Please note that measurements may vary by size. Show 'em what you're really made of by powering through those last grueling miles in the Brooks® Ariel '16 running shoe! Surface: Road. Differential: 12 mm. Built for the sever overpronator who requires motion control and high-level cushioning. Moisture-managing Element mesh upper supplies protection from various elements, while maintaining a cool in-shoe environment. External, structured saddle allows for adjustable support. Lace-up closure. External heel counter helps stabilize the foot. Plush tongue and collar. Element mesh lining wicks moisture away, and offers a great in-shoe feel. Removable sockliner.